Here's a look at the Class Power Rankings after Day 3. 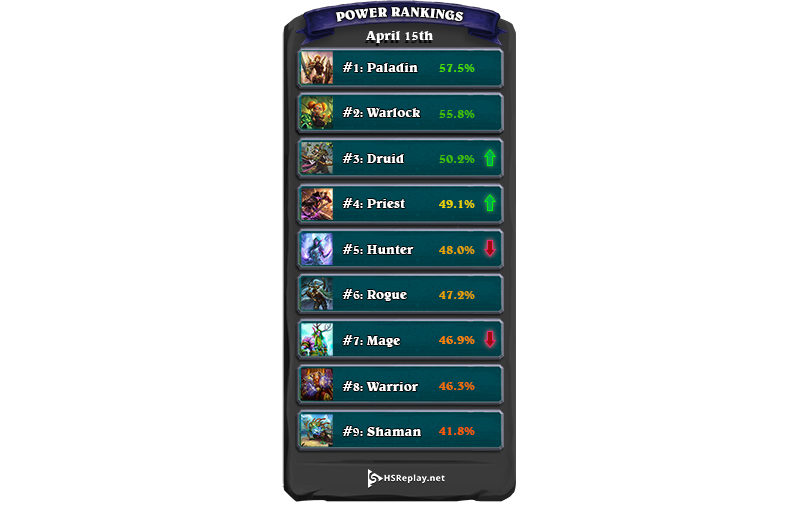 Paladin and Warlock are maintaining their dominance from Day 1. With the rise of the Paladin decks, Hunter has come down to the middle of the pack and struggling to find answers again Paladin. Druids have had some more success with couple strong decks, one of which we'll discuss below. Shaman players however are still searching for a high tier deck and yet to find one. So what class is everyone playing today? 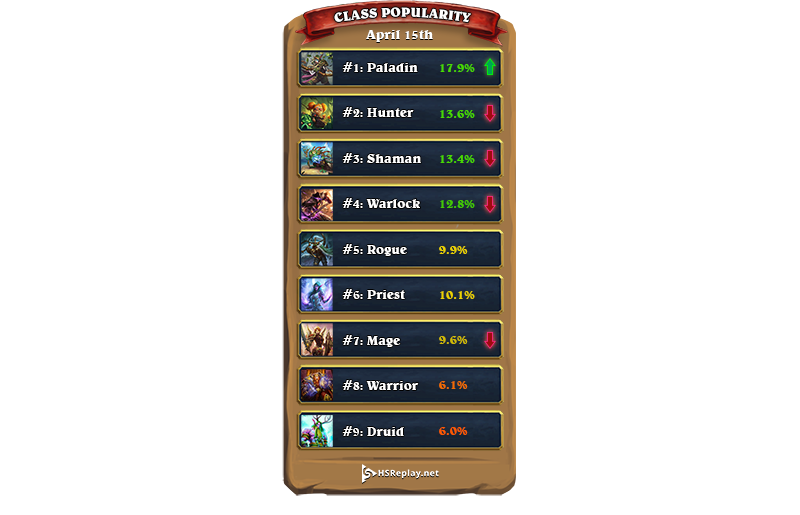 Here are the rankings according to the class popularity. No surprise it is the Paladin showing that the player base wants to win right now. Paladin soared 6 ranks to the top which started early on Day 2. The biggest loser here was Shaman. With everyone realizing the Shudderwock Shaman is performing badly in the meta, we've seen a continued dropped in the popularity of Shaman. Until a new Shaman archetype is found that has a good win rate, this dropping trend will continue. Spiteful Druid (61.7%): This druid deck is making huge waves right now. Cards like Druid of the Scythe have surprised. The deck has an array of taunts to protect against aggro decks in the early game and uses the huge Spiteful Summoner turns to swing games in it's favor. Even with all the taunt, it still doesn't do well against the top Paladin decks. It dominates almost most everything else resulting in the super high win rate. Odd Paladin (61.6%): This deck seems to be settling a bit into a faster and more aggressive version with Abusive Sergeant and Acherus Veteran. The old but rarely used Raid Leader is finally seeing a place in a top tier deck in standard helping with buffing the wide boards this deck creates. Even Paladin (60.5%): Unlike it's Odd counterpart, this deck is a little slower early on since it can depend on the power of Call to Arms to create wide swing turns. Silver Sword has created incredible value at the end of games allowing this deck to finish with a win when it appears to be running out of steam. Cube Warlock (60.5%): This deck is not using any new cards! The Doomsayers replace the Mistress of Mixtures from the old build. This just shows you how powerful the core deck has been and still stands as one of the most effective decks to counter Paladin consistently. Control Priest (59.3%): Dragons are clearly not dead in Priest. With the inclusion of the new Scaleworm to help with the loss of Drakonid Operative, this priest is still able to use Duskbreaker to help against aggro decks and has faired very well against Paladin. The deck has limited firepower so has struggled against other control decks beating Paladin at a high rate right now is all you need to do to climb the ladder. We're starting to see specific archetypes and their counters. 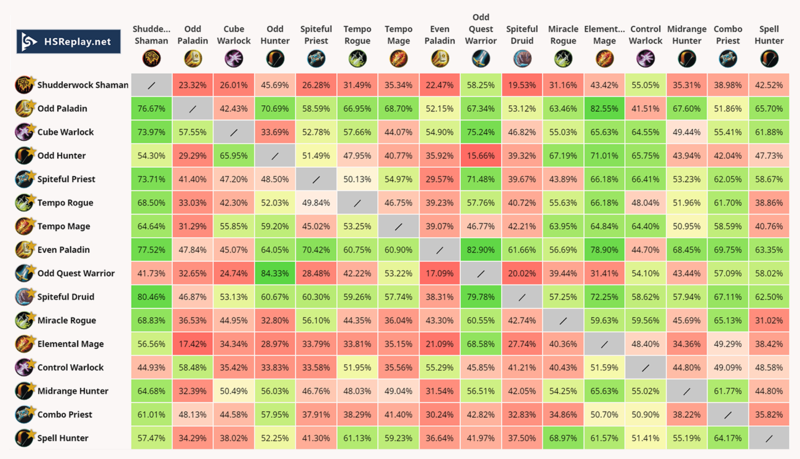 Here are the archetype matchup win rates across the board. For a full view of all the archetypes, click HERE. Day 3 of The Witchwood has shown some movement with classes like Druid but overall we're starting to see Paladin and Warlock settling in the top of this meta.